Veteran slot designers Playtech are taking us back through time to the Far East on the Ways of the Phoenix slot. However, this is isn’t just your ordinary Chinese mythology-theme game. 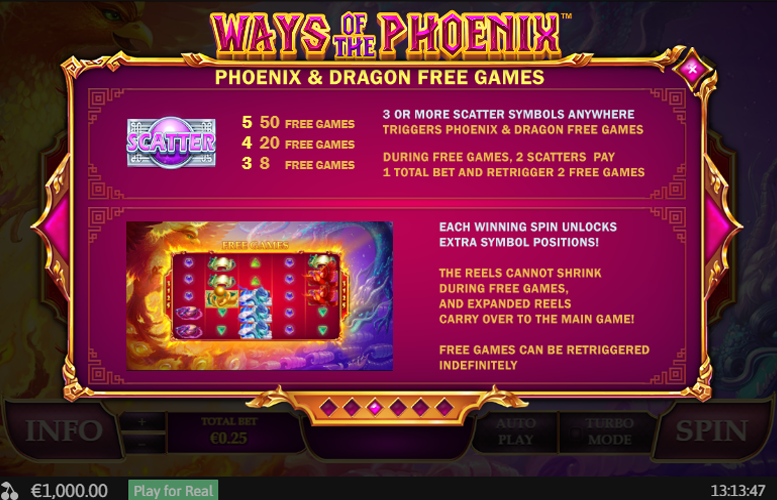 Right from the off it’s obvious that the team behind Ways of the Phoenix wanted to create a completely original slot machine. The gameboard is the first giveaway. It’s five by five symbols in size for one but several of these are inactive at the beginning of the game. Thanks to this innovative gameboard design, Playtech were able to load the title with various special features that are not possible on a standard slot machine. In the following article, we’ll explain them all to you! Let’s make a start. Innovative take on gameboard design. We loved the expanding board feature! Potentially lucrative bonus features. It’s hard to imagine not winning something with a massive bonus of 50 Free Games! Great artwork throughout. We love the illustrations of the mythological beasts and the lovingly designed background too! Such innovative game features won’t be to everyone’s tastes. Although we love seeing designers thinking outside of the box, some folk just like to stick with what they know! 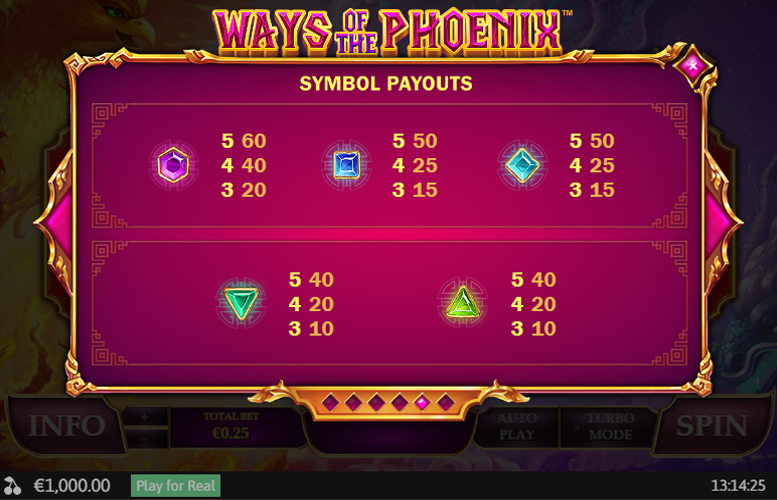 The top jackpots on the Ways of the Phoenix slot machine are each awarded for matching five of the same high value symbols in adjacent positions on consecutive reels (more on this later). The symbols representing these larger payments are inspired by Eastern mythology. Phoenix = 500x the line bet. Dragon = 300x the line bet. Drum = 100x the line bet. Scroll or Coins = 70x the line bet. “Scatter” = 50x the line bet. Players unlock additional ways to win with every consecutive winning combination they land. Parts of the board that were inactive literally come to life as more wins hit the grid! 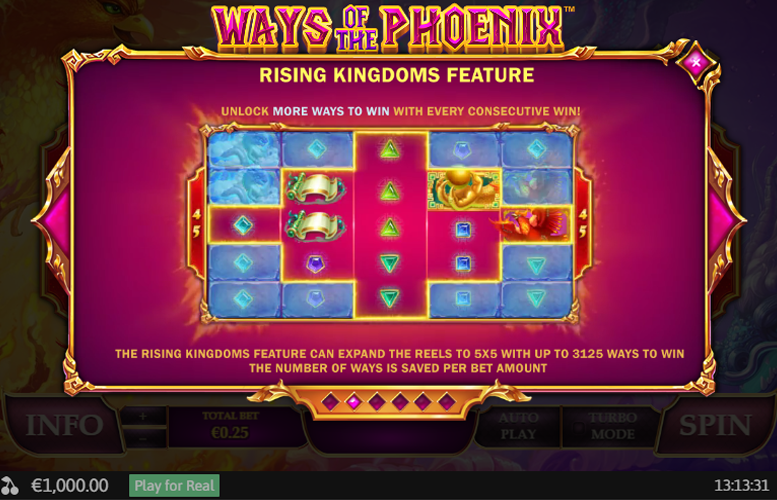 The Rising Kingdoms feature can expand the reels to a massive five by five grid with an impressive 3,125 ways to win. Players should note that the number of ways to win is saved per bet amount – changing it will reset the grid to its default. 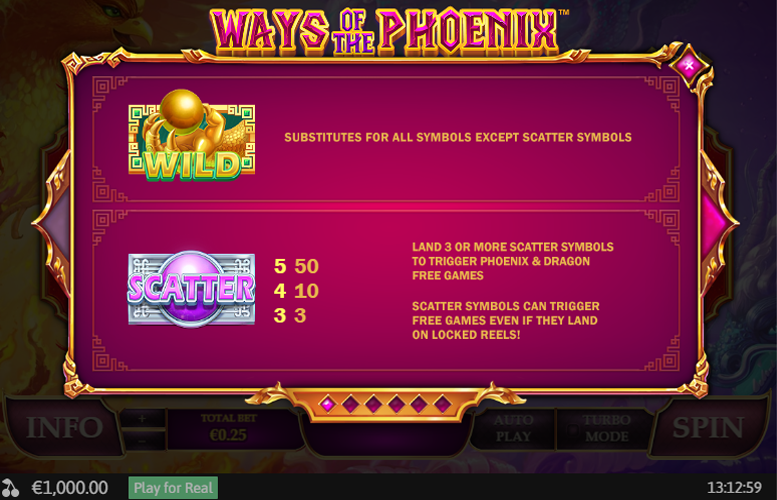 Landing three or more “Scatter” symbols anywhere on the grid will trigger the Phoenix and Dragon Free Games. Players should note that during this Free Games mode, two “scatter” symbols landing on the reels will award them with a payment of 1x the total bet amount. An additional two free games will also be triggered. Additional Free Games can be retriggered indefinitely too. What’s more, during the Phoenix and Dragon Free Games, the reels cannot shrink, and expanded reels will carry over back to the main game! Five “Scatters” = 50 Free Games. Four “Scatters” = 20 Free Games. Three “Scatters” = 8 Free Games. The All Ways betting system is active on all five reels. This means that any combination of symbols on adjacent reels from left to right will pay regardless of the symbols’ position on the reel. All wins are multiplied by the coin value which is the total bet divided by the number of coins (25). In addition to the higher value symbols on the Ways of the Phoenix slot machine, there are also those that don’t award such large prizes. These are represented simply by different coloured gem stones. Purple Gem = 60x the line bet. Blue Gem = 50x the line bet. Turquoise Gem = 50x the line bet. Either Green Gem = 40x the line bet. 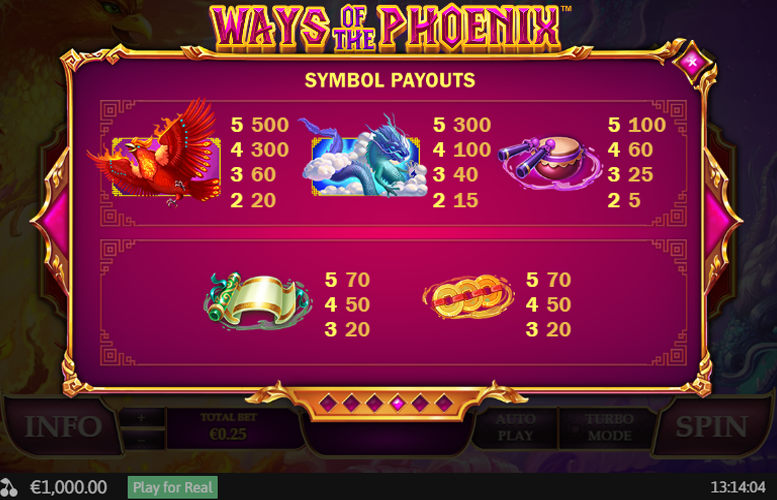 The Ways of the Phoenix slot machine might not have typical win lines but in terms of bet distribution, it plays like there were 25 fixed win lines. Players are only able to adjust the total amount bet. The minimum value here is just 25p and the maximum is £100. Whilst this upper betting limit is clearly not the largest we’ve ever encountered, most players will find it more than enough. It’s rare to find a gambler wanting to wage more than £100 per spin anyway! All things considered, the Ways of the Phoenix slot machine is an absolute winner. In terms of gameplay features, players are treated to a host of different dynamics made possible by the innovative take on gameboard design. The slot doesn’t rely solely on its interesting features, however. It’s also something of a looker too. The symbols and backgrounds have been expertly designed, giving it a strong visual presence to match its creative and entertaining gameplay.